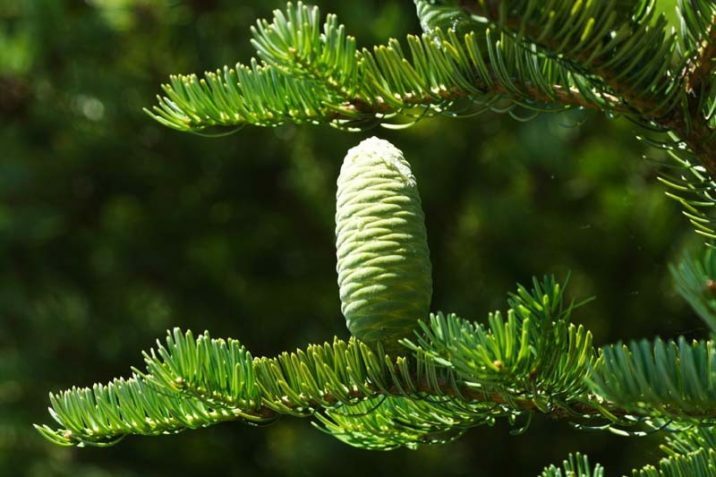 Abies holophylla, first described in 1866 by Carl Maximowicz (1827–1891) is commonly known as Manchurian fir, or as 杉松(zh) in the Chinese language. Description. 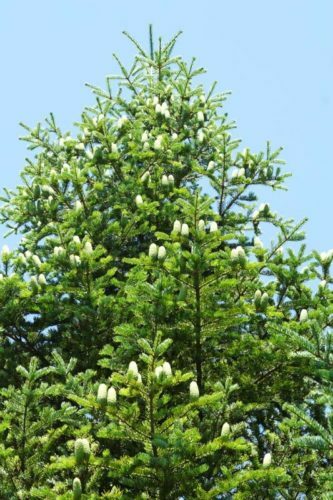 Manchurian fir is an evergreen coniferous species of tree which grows to mature heights of 100 feet (30 m) tall with a 3 feet (1 m) diameter trunk, measured at breast height, and a narrow conical crown of horizontally spreading branches. The bark is scaly and gray-brown with resin blisters. The leaves are flattened, 0.8 to 1.6 inches (2 - 4 cm) long and 0.06 to 0.1 inch (1.5 - 2.5 mm) thick, spread at right angles from the shoot, and ending in a point. The shoots are glabrous, shiny yellow-gray when young and turning gray-brown when mature. The needles spread on two sides, but not flat like in the case of Silver fir (A. alba). Usually they more or less rise up forming a v-shaped empty compartment above the shoot. 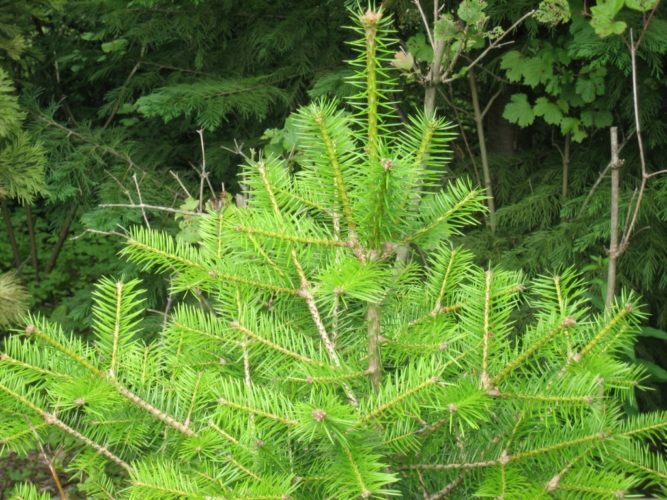 Unlike Silver fir, the leaves of A. holophylla are sharp and prickly, with no indentation at the top. They are bright green above and whitish-green below with 2 whitish strips, each of which is formed by 7 to 10 wax-covered stomatal bands. The seed cones are 4.8 to 5.5 inches (12 - 14 cm) long by 1.6 to 2 inches (4 - 5 cm) broad, yellow-brown, and slightly tapering with a bluntly rounded apex. The scale bracts are hidden under the cone scales. The seeds, 03 to 0.35 inch (8 - 9 mm) long with wedge-shaped wings 0.6 inch (1.5 cm) long, are released after the cones disintegrate at maturity in October. Distribution. This species is native to Russia — southern Ussuriland; China — Heilongjiang, Jilin, and Liaoning provinces; and North Korea; growing at elevations of up to 5,000 feet (0 - 1,500 m) above sea level. New buds of Abies holophylla. 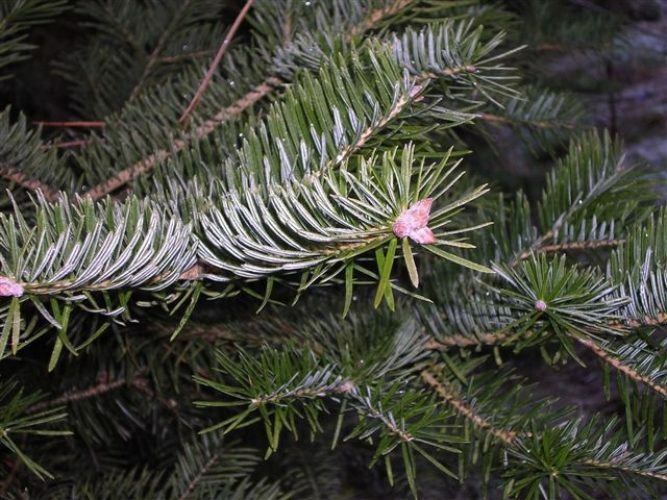 Manchurian fir (Abies holophylla) with a young developing cone showing resin.